When you have achieved the living out of normal humanity, and have been made perfect, although you will be unable to speak prophecy, nor of any mysteries, you will be living out and revealing the image of a human. God created man, after which man was corrupted by Satan, and this corruption has made people into “dead bodies”—and thus, after you have changed, you will be different from these dead bodies. It is the words of God that give life to people’s spirits and cause them to be reborn, and when people’s spirits are reborn they will have come alive. Mention of the “dead” refers to corpses that have no spirit, to people in whom their spirit has died. When people’s spirits are given life, they come alive. The saints that were spoken of before refer to people who have come alive, those who were under Satan’s influence but defeated Satan. The chosen people of China have endured the cruel and inhumane persecution and trickery of the great red dragon, which has left them mentally ravaged and without the slightest courage to live. Thus, the awakening of their spirits must begin with their substance: Bit-by-bit, in their substance their spirit must be awakened. When, one day, they come alive, there will be no more obstructions, and all will proceed smoothly. At the moment, this remains unachievable. Most people’s living out contains much of the atmosphere of death, they are shrouded in an aura of death, and they lack too much. Some people’s words carry death, their actions carry death, and almost everything they live out is death. If, today, people publicly bear testimony to God, then this work will fail, for they have yet to fully come alive, and there are too many dead among you. Today, some people ask why God doesn’t show some signs and wonders so that He can quickly spread His work among the Gentile nations. The dead can’t bear testimony to God; only the living can, but most people today are dead, too many of them live in the cage of death, they live under the influence of Satan, and are unable to gain victory—and so how could they bear testimony to God? How could they spread the work of the gospel? Those who live under the influence of darkness are those who live amid death, they are those who are possessed by Satan. Without being saved by God, and judged and chastised by God, people are unable to escape the influence of death, they cannot become the living. These dead can’t bear testimony to God, nor can they be used by God, much less enter the kingdom. God wants the testimony of the living, not the dead, and He asks that the living work for Him, not the dead. “The dead” are those who oppose and rebel against God, they are those who are numb in spirit and do not understand God’s words, they are those who do not put the truth into practice and have not the slightest loyalty to God, and they are those who live under the domain of Satan and are exploited by Satan. The dead show themselves by standing in opposition to the truth, by rebelling against God, and by being lowly, contemptible, malicious, brutish, deceitful, and insidious. Even though such people eat and drink the words of God, they are unable to live out the words of God; they live, but they are the walking dead, they are breathing corpses. The dead are totally incapable of satisfying God, much less can they utterly obey Him. They can only deceive Him, blaspheme against Him, and betray Him, and all that they live out reveals the nature of Satan. 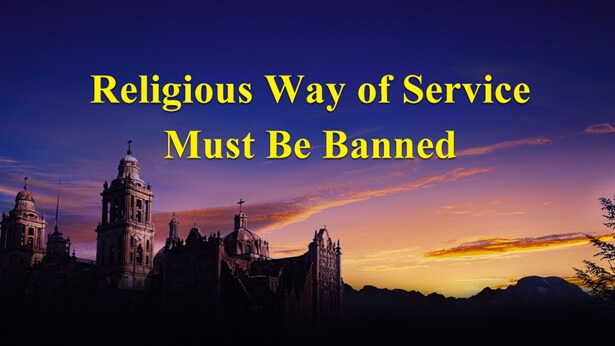 If people wish to become living beings, and to bear testimony to God, and to be approved of by God, they must accept God’s salvation, they must gladly submit to His judgment and chastisement, and must gladly accept the pruning and dealing of God. Only then will they be able to put all of the truths required by God into practice, and only then will they gain God’s salvation, and truly become living beings. The living are saved by God, they have been judged and chastised by God, they are willing to devote themselves and are happy to lay down their lives to God, and they would gladly dedicate their whole lives to God. Only when the living bear testimony to God can Satan be shamed, only the living can spread the gospel work of God, only the living are after God’s heart, and only the living are real people. Originally the man made by God was alive, but because of Satan’s corruption man lives amid death, and lives under the influence of Satan, and so these people have become the dead who are without a spirit, they have become enemies who oppose God, they have become the tools of Satan, and they have become the captives of Satan. All the living people created by God have become dead, and so God has lost His testimony, and He has lost mankind, which He created and is the only thing that has His breath. If God is to take back His testimony, and take back those who were made by His own hand but who have been taken captive by Satan, then He must resurrect them so that they become living beings, and He must reclaim them so that they live in His light. The dead are those who have no spirit, those who are numb in the extreme, and who oppose God. Moreover, they are those who do not know God. These people have not the slightest intention of obeying God, they only rebel against Him and oppose Him, and have not the slightest loyalty. The living are those whose spirits have been reborn, who know to obey God, and who are loyal to God. They are possessed of the truth, and of testimony, and only these people are pleasing to God in His house. God saves those who can come alive, who can see God’s salvation, who can be loyal to God, and willing to seek God. He saves those who believe in God’s incarnation, and believe in His appearance. Some people can come alive, and some people can’t; it depends on whether their nature can be saved or not. Many people have heard a lot of God’s words yet do not understand God’s will, they have heard God’s many words but are still incapable of putting them into practice, they are incapable of living out any truth and also deliberately interfere with God’s work. They are incapable of doing any work for God, they cannot devote anything to Him, and they also secretly spend the church’s money, and eat in the house of God for free. These people are dead, and they will not be saved. God saves all those who are amid His work. But there is a part of them who cannot receive His salvation; only a small number can receive His salvation, for most people are too dead, they are so dead that they cannot be saved, they have been totally exploited by Satan, and in nature, they are too malicious. Neither was that small number of people fully able to obey God. They were not those who had been absolutely faithful to God since the beginning, or who had the utmost love for God since the beginning; instead, they have become obedient to God because of His work of conquest, they see God because of His supreme love, there are changes in their disposition because of God’s righteous disposition, and they come to know God because of His work, which is both real and normal. Without this work of God, no matter how good these people are they would still be of Satan, they would still be of death, they would still be dead. That, today, these people can receive God’s salvation is purely because they are willing to cooperate with God. Because of their loyalty to God, the living shall be gained by God and live amid His promises, and because of their opposition to God, the dead shall be detested and rejected by God and live amid His punishment and curses. Such is the righteous disposition of God, and it is unchangeable by any man. Because of their own seeking, people receive God’s approval and live in the light; because of their cunning schemes, people are cursed by God and descend amid punishment; because of their evildoing, people are punished by God; and because of their yearning and loyalty, people receive God’s blessings. God is righteous: He blesses the living, and curses the dead, so that they are always amid death, and will never live in God’s light. God will take the living into His kingdom, He will take the living into His blessings to be with Him forever. The dead He will strike into eternal death; they are the object of His destruction, and will always belong to Satan. God treats no one unjustly. All those who truly seek God will surely remain in the house of God, and all those who are disobedient to God, and incompatible with Him will surely live amid His punishment. Perhaps, you’re unsure about God’s work in the flesh—but one day God’s flesh will not directly arrange man’s end; instead, His Spirit will arrange man’s destination, and at that time people will know that God’s flesh and His Spirit are one, that His flesh cannot commit error, and that His Spirit is even more incapable of error. Ultimately, He will surely take those who come alive into His kingdom, not one more, nor one less, and those dead who have not come alive will be tossed into the cavern of Satan.